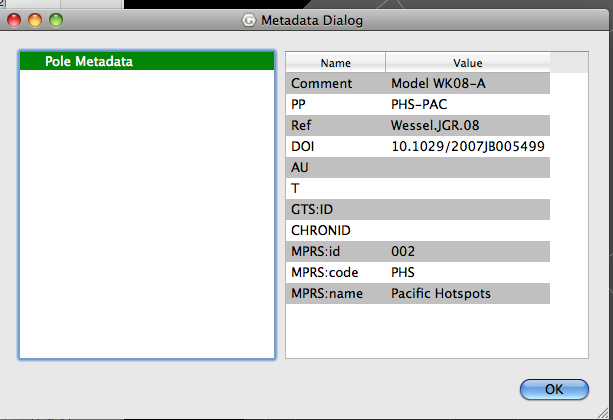 The word “metadata” means “data about data”. Metadata articulates a context for objects of interest — “resources” such as MP3 files, library books, or satellite images — in the form of “resource descriptions”. As a tradition, resource description dates back to the earliest archives and library catalogs. The modern “metadata” field that gave rise to Dublin Core and other recent standards emerged with the Web revolution of the mid-1990s. Now, such information is important when it comes to the ‘semantic web’ and having machines to process such files – something Matt Hall from Agile recently commented on “Machines can read, too“). This means there is information about the author, access rights, description of the content and coverage (spatial and temporal) and contributors (where there is no publication for a rotation sequence yet), plus some info on how to programmatically process the data, encoded. The GROT format is naturally not as engineered as GPlates’ GPML files or GeoSciML, but I think it strikes a good balance between easy enough to edit by hand in a text editor while maintaining some structure in order to automatically process the file content. However, when expanding the individual sequences you are now exposing chunky parts of metadata for each moving plate rotation sequence or the individual rotation – again this was only in an earlier development version and will not be in release 1.3. Now, note the structured fields in the right window – Here the user can specify geological timescales used for the rotation sequences, magnetic anomaly chron IDs, the reference(links to a local BibTeX database/ and DOI of the publication. In addition author names (AU), modification time (T) and plate pair (PP) can be added as valuable comments. In future incarnations there will hopefully be a hyperlink so that one can just click on the DOI in GPlates and get automagically taken to the publication. With the new GROT file format, the possibility also now exists to link certain features into the rotation file. 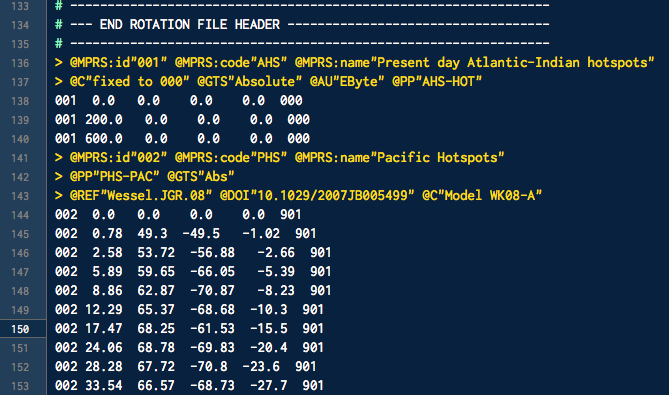 In the following screenshot, the rotation of South America (201) relative to Africa (701) is specified based on picks of magnetic anomaly chrons (@CHRONID”…”). This structured format now allows to (theoretically) extrat all magnetic picks of e.g. CHRONID=”CAn18″ from a geospatial pick database with a simple where the plate id = 201 and the conjugate plate ID = 701. Detailed annotations of stage poles allow linking to geospatial features, such as magnetic anomaly picks expressed through a CHRONID tag. 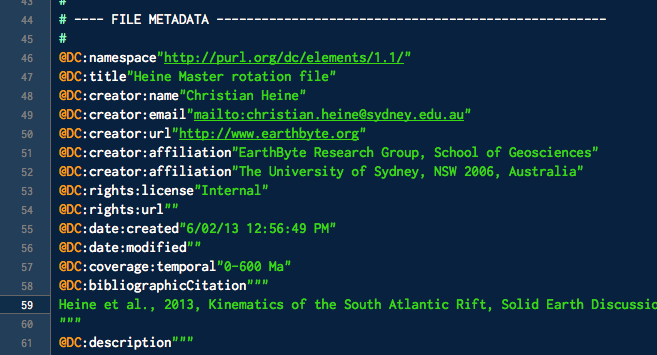 So with the upcoming release of GPlates v1.3, finally structured, meta-data rich rotation files have arrived. More examples and some updated on the final release features should follow later. This entry was posted in GPlates and tagged File format, GROT, Plate reconstructions on 20/05/2013 by Christian.